Every time I turn around I see more openings for the material to do something else. 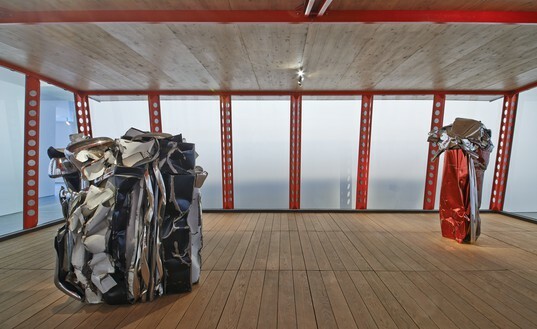 It seemed to me that sheet steel offered unlimited possibilities: cut up, then bent, rolled, and welded, it let you create all the profiles you needed for specific purposes, from straight lines to angles to curves. 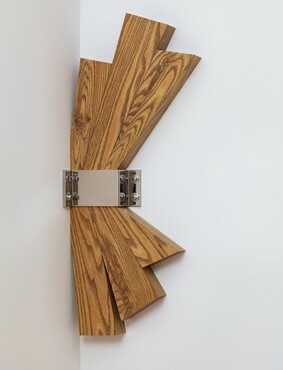 Gagosian New York, in collaboration with Galerie Patrick Seguin, Paris, is pleased to present works by American artist John Chamberlain and French architect and designer Jean Prouvé, two twentieth-century innovators who harnessed the strength and suppleness of metal to new potential in their respective fields. 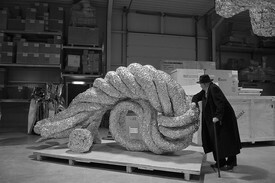 Large- and small-scale sculptures by Chamberlain will be in visual dialogue with two prefabricated houses and key architectural models by Prouvé. 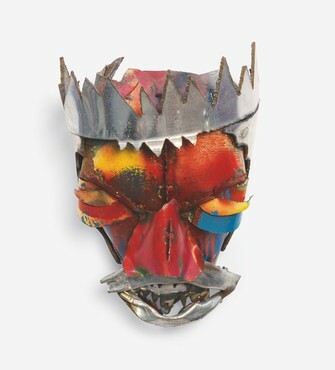 John Chamberlain began to create distinctive metal sculptures from industrial detritus during the late 1950s. 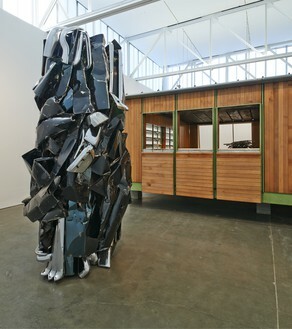 While freely experimenting with a range of inexpensive materials—including paper bags, Plexiglas, foam rubber, and aluminum foil—again and again he returned to metal car components such as bumpers and hoods, which he dubbed “art supplies.” The assemblages preserve traces of his manipulation of machine-made elements: crumpling, bending, twisting, painting, and welding steel to form deliberate gestures, he then fused these individual sections into thrilling multicolored aggregations that range from miniature to monumental. 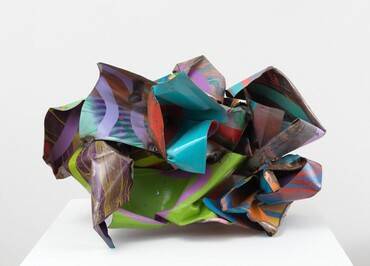 The contrasting parts of the majestic CLOUDEDLEOPAROEXPRESSO (2010) suggest clusters of layered, three-dimensional brushstrokes, while the intertwined parts of ENTIRELYFEARLESS (2009) appear as a chrome and satin red tangle. 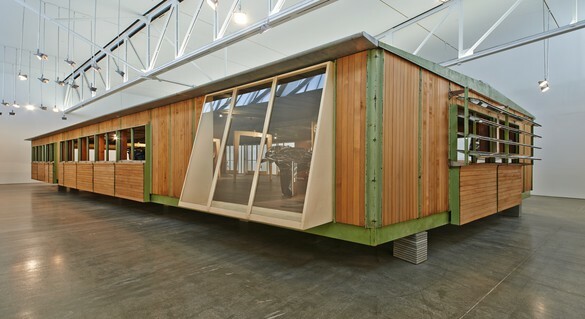 Jean Prouvé is widely acknowledged as one of the twentieth century’s most influential industrial designers. A self-taught engineer and passionate teacher, metalworker, architect, and designer, he brought a strong social conscience to his pragmatic structural approach. 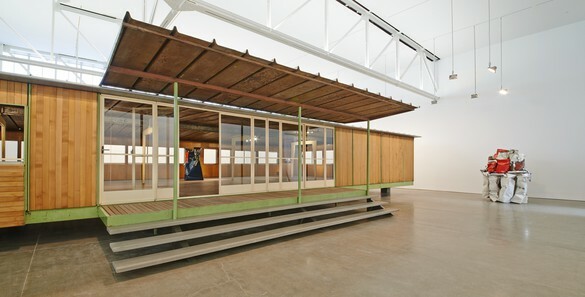 Prouvé created furniture for the home, office, and classroom—as well as prefabricated houses, building components, and façades—for more than sixty years. 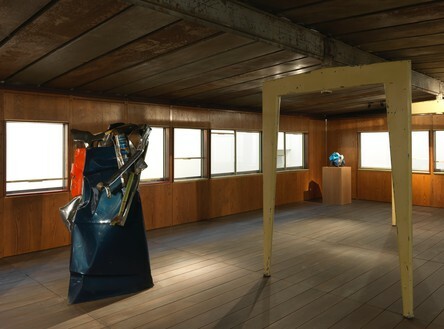 Consistent with his belief that “in their construction there is no difference between furniture and buildings,” he applied the same principles used in the making of furniture to his architecture of the postwar reconstruction. Streamlining research, development, and production, he was instrumental in ushering in building processes based on mechanized industry rather than artisanal craft. 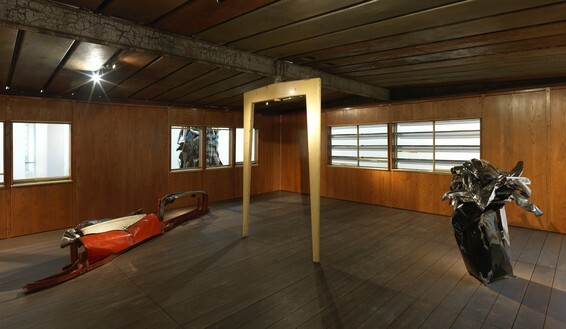 The Ferembal Demountable House (1948), designed as the offices of the eponymous tin goods manufacturer, is a quintessential example of Prouvé’s inventive approach in which steel portal frames form a structural core. Rescued from the demolition of the Ferembal site, the house is a striking and eloquent example of the technical and functional virtues of his prefabricated designs, as well as their adaptability. 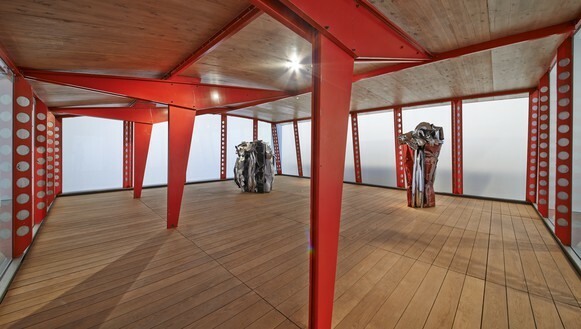 In 2010, at the initiative of Galerie Patrick Seguin, Jean Nouvel adapted and modularized this building, testifying to the enduring relevance of Prouvé’s design and practice. The asymmetrical Villejuif Demountable House is a lightweight project whose sheet-steel props support a cantilevered wooden roof. 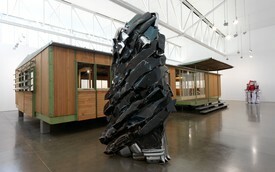 It was Prouvé’s response to a 1956 commission for a schoolhouse that could be easily dismantled and relocated. The school was later disassembled and its components used in other buildings. 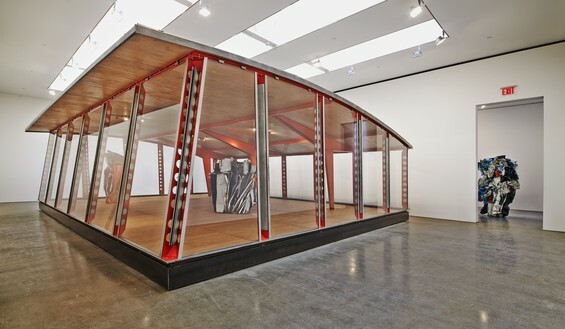 Prouvé’s design and engineering of these versatile structures and their components is now considered to be a milestone in twentieth-century architecture. 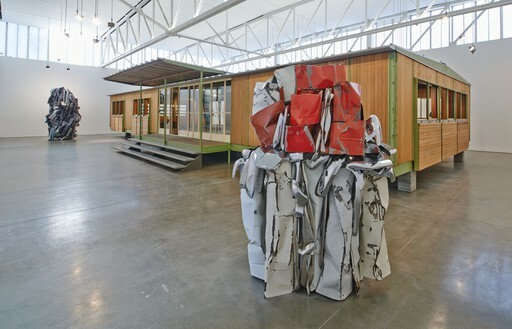 The spare elegance of Prouvé’s architecture underscores the eruptions of form and color that Chamberlain’s sculptures achieved with like materials, in a striking intersection of groundbreaking functionality and raw creative exuberance. 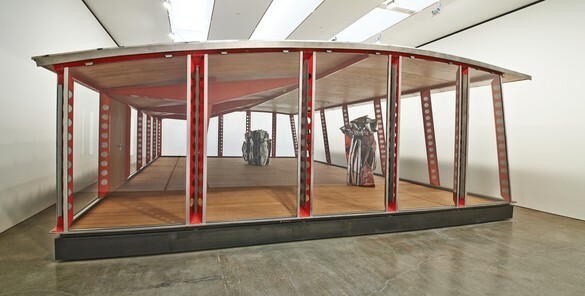 Two twentieth-century heavyweights collide in a show of works by John Chamberlain and Jean Prouvé in New York. 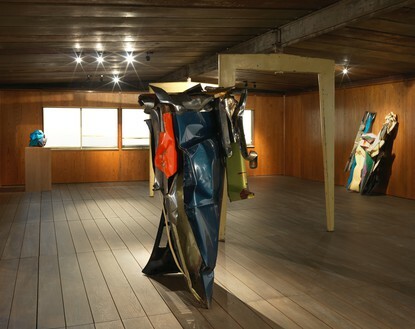 Derek Blasberg talks to Patrick Seguin about Prouvé and design on the occasion of the exhibition. 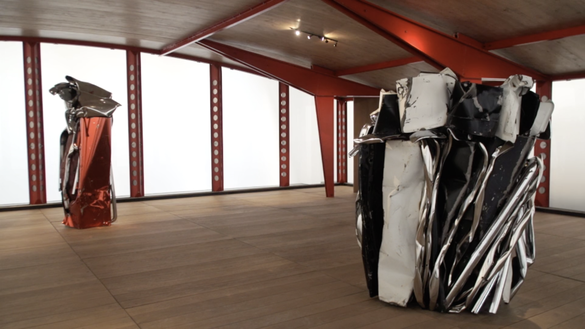 In Foil Adventures: John Chamberlain’s Late Works in Aluminum, Corinna Thierolf discusses how, starting in the mid-1960s, the artist investigated and perfected working with this material.